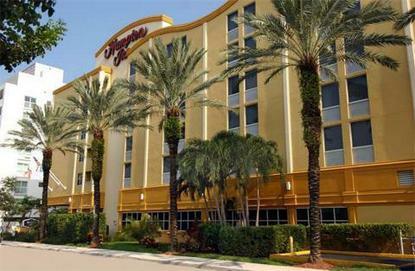 The Hampton Inn Miami-Coconut Grove/Coral Gables is the best hotel value in Coconut Grove/Coral Gables and the most conveniently located for those visiting Miami. Located in Coconut Grove just minutes from Coral Gables, downtown business districts and many other attractions, the hotel features a unique Floridian style and offers many features to leisure and business guests. FREE High Speed Internet Access in all guestrooms. Our amenities include complimentary deluxe continental breakfast bar, free local telephone calls, free parking, free in-room movies, and free coffee, tea and hot chocolate served 24 hours in our lobby. We also offer voice mail and dataports, microwave, refrigerator, swimming pool and whirlpool, fitness center, hospitality suites/meeting rooms, special discount at area restaurants for our guests, and multi-lingual staff. Guest coin laundry, meeting/banquet facilities, pay-per-view movies and babysitting/child services are available for a nominal fee.